Product #1101 | SKU 816 | 0.0 (no ratings yet) Thanks for your rating! The Manfrotto Super Salon 280 Camera Stand offers support for every camera size, and generally vary by versatility of their movements. They're equipped with retractable wheels for easier placement around the studio. The Super Salon 280 (old cat #0841) is Manfrotto's flagship of the segment, sporting a pneumatically dampened column which travels nearly to the height of 2.7 m. The Super Salon 280 has a 10.2 cm diameter black anodised aluminium column and a 1 m in horizontal camera arm that travels 62 cm. The wheels are engaged and disengaged with a single foot pedal, and the lateral arm sports a counterbalanced rack-and-pinion drive mechanism. The camera support platform allows movement of 360°. 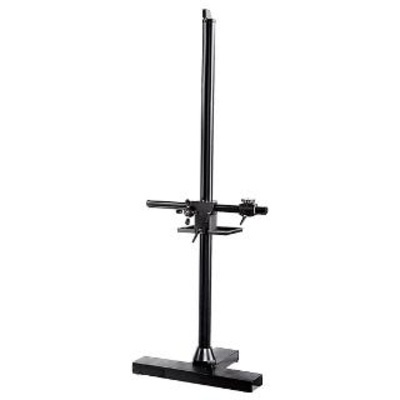 The arm is accurately counter-balanced to move smoothly up and down.